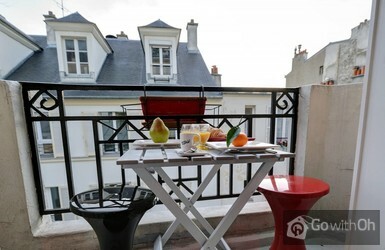 This beautiful and cozy apartment lies in the area of Montmartre and invites you into a pleasant and relaxing atmosphere. It is located in a quiet paved street, on the third and last floor (without lift access) of a beautiful brick house. With an area of 35m² it can accommodate up to 4 people. The living room offers a double sofa bed as well as a balcony facing the south, with a clear view. The fully equipped kitchen will satisfy all your cooking needs and in the separate bedroom you can relax on the double bed, store your belongings in the provided closet and use a small working space. You will also have access to Internet via Wifi, a big flat screen satellite-TV, an iPod dock station and a DVD-player. In the cozy bathroom you can enjoy a peaceful moment in the wonderful bathtub after a busy day in the city. Thanks to the double-glazed windows and the doors that separate every room in the house your maximum noise-free comfort is assured. For this and many other reasons this apartment is an ideal choice for a couple, a family or a small group of friends. The metro station Abesses on line 12 is only 3 minutes away by foot and will allow you to easily reach almost any place in the city. Also, thanks to the proximity to the famous Place Pigalle and the Sacré Coeur, you will not have any problems finding many different shops, cafeterias, bars and restaurants, in which you can either lay back or enjoy the true Paris by night. Do not miss the chance to stay in this wonderful apartment! Check in is from 1500hrs until 1900hrs. From 1900hrs until 21hrs the owner charges an additional 50. Arrivals after 2100hrs are not accepted. Check in on Sundays incur an additional cost of 50 (payable on arrival and accumulative depending on the arrival time). No check in on French Bank Holidays. Check out is until 1100hrs. Cot available on request for an additional 30 per stay (availability must be confirmed with the owner before arrival). The remaining amount can be paid by credit card on arrival. We accept only Visa and Mastercard and there is an extra charge of 2%. 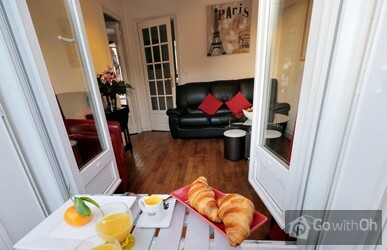 The apartment is also better than pictures: clean, comfortable, in a quiet street, with a decor very nice. 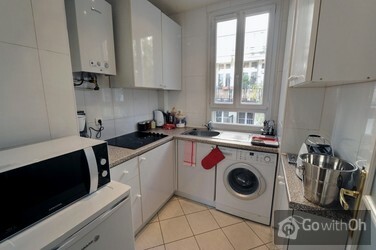 The tube is very close to the house, just 5 minutes of walking and in the zone there is everything: bars, restaurants, bakeries, hairdressers, supermarkets... We had a very good time in Paris, also thanks to this apartment. I advise it. The apartment was well appointed, clean and very suitable for a short stay. It was well situated for easy access to a number of metro stations. Generally the service was very good indeed. I woudl suggest that a clearer map or written direction for the metro stations would be helpful as the street ...plan is not straightforwad and we found ourselves going in the wwrong direction initially. Some information in the flat about the surrounding area would also be very useful - maybe recommendations of restuarants etc. The only ( minor ) problem was that there was no instruction on when to deposit rubbish when leaving and as you say you will deduct monies from the deposit if this is not done, it would be helpful to know where this is to be done. Otherwise we had a lovely stay in a comfortable flat. There were 3 of us staying which I would suggest is the maximum capacity unless the fouth person was very small! Mit der Wohnung waren wir sehr zufrieden nur war es leider sehr laut wegen der Baustelle im Hof des Hinterhauses. Pressluftgehämmer von 9 bis 12 und 14 bis 17 Uhr. Zum Glück aber nur an den Werktagen. Anscheinend ist diese Baustelle aber bald fertig, es sah so aus, als ob es nur einige Tage dauern... würde. Schlafen konnten wir zum Glück trotzdem, es wurde ja nur tagsüber gearbeitet(es gab nur einmal Partylärm in der Nachbarwohnung) und tagsüber waren wir viel unterwegs. Ansonsten ist die Wohnung aber sehr schön und auch sehr ruhig gelegen. Die Schlüsselübergabe hat problemlos geklappt und wir konnten auch unsere Koffer noch bis abends abstellen. Hat alles problemlos geklappt und wir konnten unseren Urlaub geniessen. I would like to say thanks you for the perfect accommodation in the Paris. Everything was fine and we hadn´t any problems in the flat. 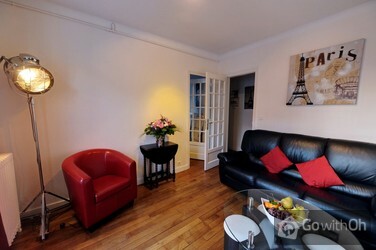 We felt comfortable in the flat for the duration of our stay in Paris. Surely I recommend it my friends. Thanks! First class , absolutely as described,and a very enjoyable stay for us. The only thing we missed was large cups(for tea). Although we didn't watch much TV ,satelite with a few English speakig channels would have been good. Absolutely, wonderful place to stay, only one small comment that the apartment was not cleaned but the agency was able to quickly provide a cleaner to tidy up the flat. Prima accomodatie. 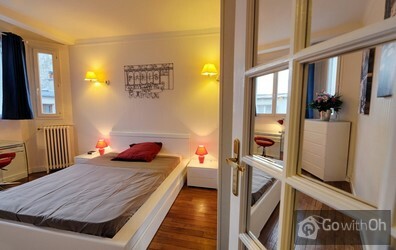 Grote slaapkamer is helemaal super "Paris" en comfortabel/luxe. Netheid (voor nederlander :-) ) laat hier en daar wel te wensen over. Wasmachine is handig alleen hebben we deze niet gebruikt omdat er geen droogrek was! (dit doorgegeven aan de zeer vriendelijke contactpersoon) ...Balkonnetje is leuk voor foto's. Maar.... als je op je tenen gaat staan zie je wel het bovenste deel van de Eiffeltoren boven de daken uitsteken, aan de overkant! Wat een leuke verrassing was dit! 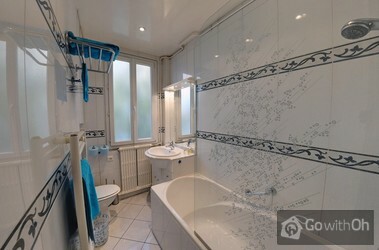 De ligging algemeen van het appartement is fantastisch, Metro vlakbij (Abbesses), en de gezelligheid van de toeristen door de Sacre Coeur. Boulangerie om de hoek, en wat een leuke terrasjes voor eten en drinken. In deze wijk voel je je al snel een beetje Parijzenaar onder de Parijzenaren! Dus al met al een heerlijk appartement voor 2 volwassenen met kleine kinderen. Of je moet met wat minder nachtrust afkunnen! En wat is de metro een geweldig vervoermiddel, hoe betrouwbaar en snel. Meer dan 12 x per uur op de seconde op tijd...!!! Bedbank is niet geschikt voor grotere kinderen of volwassenen. Is al doorgezakt en te dunne matras. Te weinig keukengerei. bv: er zijn geen grote koffiemokken, en er is geen pollepel voor soep op te scheppen. Geen droger aanwezig, dus droogrek zou wel handig zijn. Verder hebben we genoten van dit appartement. Schönes Appartment in lebendiger Umgebung. The apt was very clean and nice, but at night very noicsy. One can hear people speaking drinking etc. from 3 am until 5 am. We would not rent again that appt. the train had 2 hours delay. we called and informed, but when we arrived we had to stand about 30 minutes in front of the door and wait for a person to let us in. 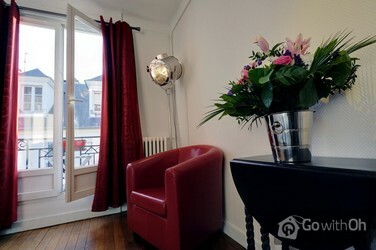 The apartment is lovely, though small, but there is everything you need for an enjoyable stay in Paris. The %u2018quartier%u2019 is very charming, lots of cafes, bars, restaurants, small shops. Friendly and uncomplicated contact person. Thank you so much %u2013 we had a good time! Het appartement was schoon, compleet en geheel volgens de beschrijving. In Montmartre en toch heerlijk rustig. Prima bed. Klein minpuntje is inderdaad dat er alleen piepkleine espressokopjes zijn. De sleuteloverdracht met Thomas verliep soepel en volgens afspraak. Einfach alles prima - würde ich wieder buchen! 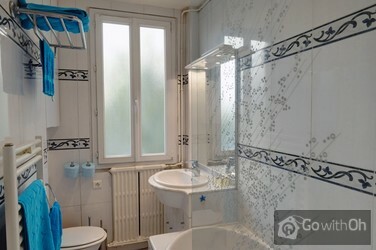 Das Apartment entsprach den Fotos, könnte aber etwas liebevolle Behandlung vertragen - abgestoßene Kanten abblätternde Farbe im Bad. Für 3 Leute sind 2 Kaffeebecher ein bißchen zu wenig, es wäre schön, wenn hier noch ein Geschirr dazu käme. Die Beleuchtung im Wohnzimmer könnte schöner ...sein: Nichts davon aber hat unseren Besuch in Paris gestört. Die Lage des Apartments ist genial, wir konnten unser Gepäck bis zur endgültigen Abreise am späten Nachmittag im Apartment einfach stehen lassen - Danke dafür! Für 2 Erwachsene und 2 Kinder ausreichend Platz. Das wichtigste war vorhanden. Die küchenausstattung sollte nochmal überprüft werden. Z.b. Wäre ein Abtropfsieb und Eierbecher sinnvoll. Nice appartment. It was clean and good maintained. Dear client, Thank you very much for your comments, which we of course take into serious consideration. We regret that your stay was not entirely pleasant and confirm that the mentioned problems with the tubes have been fixed in the meantime. We also confirm that, as notified by our Customer Service Department, we have taken all the necessary steps in order to compensate our clients for the inconveniences occurred. We can only repeat that we are taking all measures in order to improve our services day by day, so that problems like these will not be repeated in the future. Apartamentai nedideli, bet jaukus. Gatvele labai rami, jokio triuksmo. Bute rasite visko, ko jums reikia pragyvenimui. Keletas nedideliu minusiuku- lova svetaineje nelabai patogi miegojimui ir 2 arbatos puodeliai 4asmenim:) daugiau viskas OK. Apsistoje buvome 2012 12 09. Wir waren sehr zufrieden mit der Wohnung, die Lage war super und die Kontaktperson sehr nett. Alloggio piccolino ma spazi sfruttati benissimo con accessori di prima qualità e soprattutto pulito. Abbiamo alloggiato in 4 e stiamo stati molto bene. La zona è meravigliosa, secondo me la migliore di Parigi, l'atmosfera di Montmartre è unica. Cher Client, Nous vous remercions pour vos commentaires. Nous regrettons les désagréments occasionnés par le problème de chauffage et nous en profitons pour vous informer quil a été réparé et fonctionne à présent correctement. De même nous vous confirmons que le propriétaire a contrôlé le fonctionnement des clés daccès à la salle des poubelles et garantie quelle fonctionne correctement. Die Unterkunft entsprach der Beschreibung. Kleine Mängel (Kaffeemaschine und defekter Duschschlauch) wurden vom Vermieter schnell und unproblematisch behoben. Die Lage der Wohnung ist gut. Mit der Metro alles schnell zu erreichen und im Viertel selbst genug Auswahl an Restaurants und Einkaufsmöglichkeiten. Wir haben uns wohl gefühlt! The apartment was even better than we expected - comfortable, clean, all appliances worked fine. The bedroom had plenty of dresser and closet space, the kitchen had lots of plates, glasses, utensils. The bathroom water pressure was wonderfully strong. And the wifi worked perfectly and the tv system ...gave us nice options of tv and music. The location in the Montmarte neighborhood near Sacre Couer gave us a great flavor of what it's really like to live in Paris. All in all - a great apartment. T. met us within minutes of our arrival and showed us how everything works in the apartment. He gave us great suggestions on local finds - restaurants, sites, metro, etc. Very personable and helpful. Bedroom was very spacious , although the rest of the apartment would be very small if there were four people staying there. Apartment was very well equipped with all things necessary for a week-long visit. Besonders hervorheben möchten wir dass wir Probleme mit der Kaution hatten. Bei Ankunft wurden wir von einem der Kontaktpersonen empfangen und es wurde alles Nötige besprochen. Unter anderem hinterlegten wir bar 300 Kaution die uns am Rückreisetag zu einer ausgemachten Uhrzeit in der Wohnung ...wieder bereitliegen sollte. Leider war dies nicht der Fall! Nach hektischen und schwierigen Telefonaten (die Zeit drängte), wurde die Kaution dann am Bahnhof übergeben. Es war sehr ärgerlich, scheinbar hatte es die erste Kontaktperson vermasselt und dies nicht zum ersten Mal! Die Ferienwohnung entsprach genau den Beschreibungen. Die Lage mitten in Montmartre ist ideal zur Erkundung dieser wunderbaren Stadt! Enjoyed the stay in Monmartre. Used metro at Anvers NOT Abbesses (too many steps). Enjoyed local restaurants. Wish their had been a clock with PARIS time. Didn't realise France was 1 hour ahead of UK at that time. Alloggio comodo per tre persone, molto accogliente e provvisto di ogni confort, l'unica pecca sono le scale da fare perchè lo stabile è privo d'ascensore. The apartment was ideal for myself and my friend. The bed was very comfortable and the sofa bed was adequate. The apartment had everything we needed for our 3 night stay. A very compact but perfect apartment. It was only a few minutes walk to the nearest metro and 5 minutes walk to Sacre Coeur. The ...person who met us with the keys was friendly and helpful. We were also able to leave our luggage in the apartment till 5pm on the day we were leaving as there were no other people arriving that day. 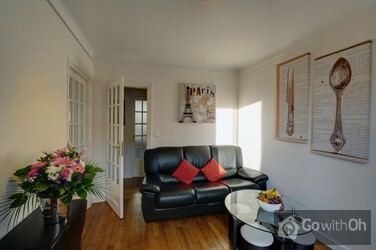 I would definitely consider this apartment again the next time I'm in Paris. 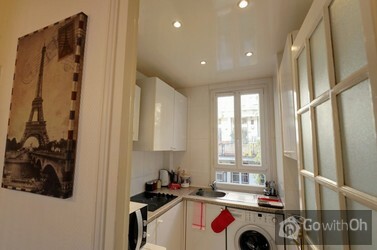 The location of this apartment is excellent in terms of proximity to the Sacre Couer, resturants and shops. Be warned though it is half way up the hill so lots of stairs and walking up hills. 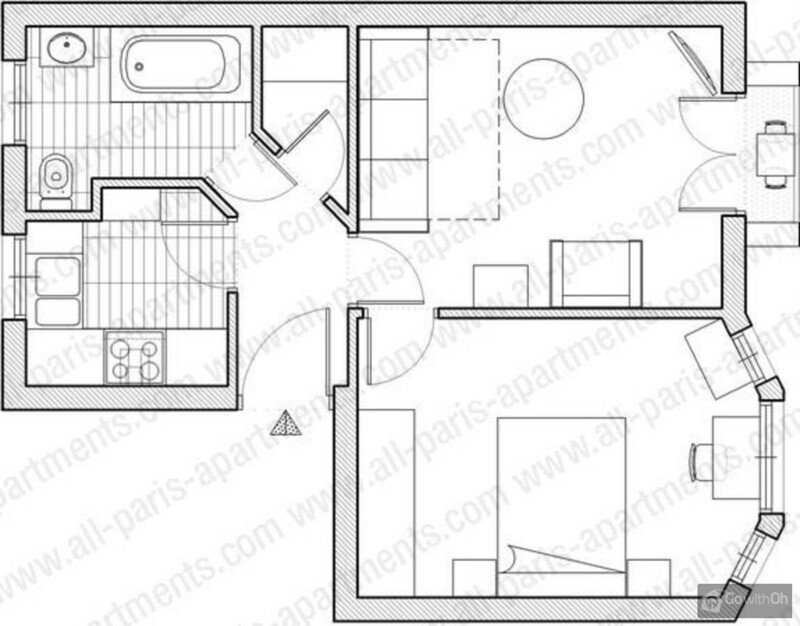 Apartment is smaller than the pictures make it look, but it is perfectly servicable, particularly for a ...couple. Keep in mind that It is on the third floor with no lift, also you need to provide items such as toilet paper and tissues. We arrived in at night and i was calling the owners but it was going straight to message bank. This was stressfull as we were arriving at 9:30pm after 20 hours of flying with a 3 year old into an unknown city and it was starting to rain. It turns out that someone was already there to meet us but i didn't know that on the way in. 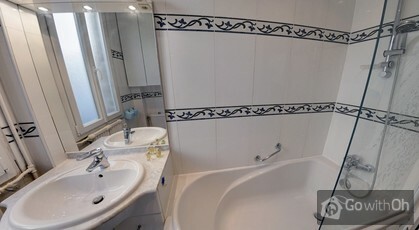 Excelente apartamento y muy bien ubicado. las escaleras pueden cansar si no estás en buena forma. En todo caso al que quiera evitar escaleras y pendientes que evite Montmartre. Pero Montmartre es una maravilla que bien vale las caminatas. El metro está a 2 calles de distancia. Quiero volver a ...Paris! buena atención. tuvimos un problemita con un desagüe en la cocina pero lo arreglaron en un tiempo razonable. Esta muy bien ubicado; eso si...un tercero sin ascensor.es chiquito pero acogedor y tiene todo lo necesario.bueno...lo unico que echamos de menos fue un mantel para la mesa que era de cristal. La verdad es que es mas que recomendable. We were really impressed with this apartment and its location. 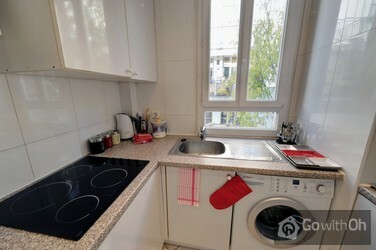 The apartment was clean, well maintained and well equiped with good quality appliances. The kitchen has plenty of plates, cups etc as well as detergent and so on. The only thing missing was a chopping board but this is easy enough to ...work around. It is an easy walk to either Anvers or Abesses metro stations. Anvers is more convenient for a connection to the airport. There are lovely cafes and shops nearby. The Moulin Rouge is a ten minute walk and the Sacre Coeur just five minutes. Montmarte is a hilly area, so it's an uphill walk from any metro station, and the appartment is on the third floor of a building with no lift, which might trouble some people but was easy enough for us. Highly recommend. El apartamento no responde a lo anunciado. La capacidad es de 2 personas y no de cuatro, porque el sofá-cama no es apropiado para dormir dos personas. La calefación no funciona bien, los radiadores calientan solo parcialmente. La situación del apartamento está en un barrio tranquilo y bohemio,... aunque dificil acceso para personas mayores. Reparar deficiencias en calefación y camas para 4 personas. También sería conveniente poner tirador en la puerta para poder tirar de ella cuando hay que cerrar el apartamento. Estimado cliente, agradecemos y valoramos sus comentarios. Comentamos que el apartamento tiene capacidad para 4 personas y que en la misma página web se indica la distribución de camas / sofá-camas. El propietario confirma haber revisado la calefacción, que ahora funciona correctamente. 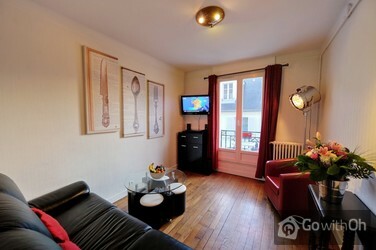 Süßes Appartement in Montmartre. Sympathische Gegend mit netten Einheimischen Nachbarn. Einziger Nachteil: im 3. Stock ohne Lift. The appartment is great! It's a bit smaller than it looks, but still large for Paris standards. The bed is very comfortable and the shower is nice, the kitchen is clean and everything you need is there, but the little balcony....wonderful! There is sun on the balcony almost all day and it has a nice... streetview. The appartment is quite noisy (you hear people for down and upstairs alot). The person who met us at the appartment (not the owner) was friendly, but he was really in a rush (we were also an hour too late because of a train delay, but we informed him), so there wasn't any time to ask questions or anything. We told him we wanted to check out at 11 AM. On the day of departure he arrived almost 40 minutes late! So that could have been better, what if we had to catch our train? The apartment was charming and easily accommodated my family of 3. It was ideally located, near a Metro station and close to great fruit/vegetable stores, butcher shops and, of course, bakeries that open early. One could still get away from the touristy site (Sacre-Coeur) to find local bars, cafes, ...and shops. We felt very safe taking walks at night. Breakfast every morning on the balcony was priceless. All appliances were in great working order and the building is quiet and very clean. Cannot say enough about the management staff, they were friendly and allowed us to access the apt early in order to drop off our luggage. All in all, a great experience. The staff was accommodating. The sent us a message prior to our arrival with contact all of their contact information, they met us at the designated time and place, made themselves available if we needed anything (we did not) and were super friendly. Merci G.!! Schlüsselempfang wurde per SMS und Telefon durchgeführt; Kein Kontakt mit Kontaktperson; Sofabett für 2 Erwachsene grenzwertig, da Bettgestell sehr klapprig; Auto in der ca. 1 km entfernten, kostenpflichtigen (ca. 25/Tag) Parkgarage abgestellt, andere Möglichkeit für PKW gibt es nicht, da alles Anwohnerparkplätze in den Straßen drumherum sind. 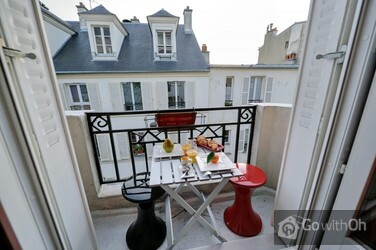 Location was excellent - right in heart of Monmartre. Really close to metro (which is so easy to master), superb food shops (green grocer, small grocer that stocks everything, deli), wonderful shopping (clothes, shoes). Apartment on 3rd level, no lift, but not a problem. Small balcony that I enjoyed... having my breakfast on. Well serviced apartment. Young woman who let us in was very helpful. Very clean apartment, all that you need was there. I would most certainly stay again, and absolutely recommend it. The district is just magical with its history, painters, restaurants. Gut: Lage. Sehr ruhig, sehr zentral. Tolles Bad. Schlecht:- Spülmaschine in der Küche leckt. Nicht nutzbar!- Keine Blumenvase für die Rosen in der Wohnung- dies ist keine 4-Personen-Unterkunft, da man vom Schlafzimmer durchs Wohnzimmer mit der Schlafcouch ins Bad gehen muss. Die ...Geschirrspülmaschine ist undicht und sollte ersetzt werden. In der Anzeige sollte deutlicher gemacht werden, dass man vom Schlafzimmer durch das Zimmer für die beiden anderen Personen ins Bad gehen muss. Our 4 night stay was excellent. The location was perfect, 5 minutes to the metro (only 15 minutes to anywhere by metro) We loved the quiet, friendly, safe area to come home to. Be aware, lots of stairs, no elevator! It is very spacious for 2. Great bed. The apartment was very clean and had ...everything we needed, including the kitchen for the bit of cooking that we did. The balcony is small but we enjoyed it everyday.The dishwasher was broken in July and it still is. We were not able to arrange an early check-in or anywhere convenient to leave our luggage after our early day arrival. As well, our host was late for the 4:00 time they gave us and didn't notify us until we were already waiting outside the door. But we Loved this apartment & would stay here again.!! The apartment has very good location, is clean and has nice interior. The spiral staircase came as a surprise. We knew there was no lift but 3 flights of spiral stairs at our age - late 60's was very hard. We were happy with the size of the rooms, but on our 1st night we went to make a coffee and the cups were dirty as were the plates and knifes & forks. We washed ...enough to use during our stay and did not use the dishwasher at all. Very disappointed. No milk, tea or coffee on our arrival so make sure you pick up these supplies at least before arriving. The toilet seat had a bolt missing which was lying on the floor and during our stay the second one came out. My husband who already has a bad hip had quite a nasty fall. The cleanliness was OK but only 1 towel each so had to wash every day and take to laundromat to dry. It is very disappointing to find almost all the dishes were dirty.And PLEASE supply a small container of milk, tea and coffee for a weary traveller to make a cup of tea or coffee on their arrival. Limpieza escasa (habia una araña enorme en el dormitorio) y sin papel de wc. Utensilios de cocina insuficientes. Excellent location very clean and all as was as advertised pre booking. Perfect for a couple. We would use it again. They were aware of our needs anf brought forward our entry time without us asking at no extra cost. Todo perfecto. el personal muy amable y la calefacción funcionaba correctamente. Aunque echamos de menos la cafetera. Volveremos!!! El Departamento estaba muy sucio. Tanto la cocina, como el baño y el living parecían no haber sido limpiados. Lage perfekt im Momartre QuartierKüchentücher fehltenWohnung nur für zwei Personen zu empfehlenSauberkeit sehr mäßigToilettenschüssel alt und nicht sauber :- Die Wohnung ist zu gut für zwei Personen, für vier nicht denkbar, Tisch zum Essen max. für zwei Personen.WC- Schüssel unzumutbar, Sauberkeit war knapp.